While browsing the Internet for Kodiak Island guides and lodges, I came upon the web page of Olga Creek Lodge. After a couple of e-mails we nailed down a week in which both my son Kris Jr. and I long anticipated. We spent the week of Aug. 26th thru Sept. 2nd at Olga Creek Lodge. If that place is not the best-kept secret in all of Alaska, I don’t know what is. In the end we experienced success far, far beyond our wildest hopes or imagination. We found serenity in the surrounding scenery and in an environment lacking Nintendo games, telephones, or fax machines. We also found a good bit of ourselves as father and son bonded in the wilderness at a time when the crossroads of life begin developing new curves. This was Kris Jr.’s first fishing trip to Alaska. At one month shy of his 15th birthday and a week before starting his freshman year of high school, I could not imagine a more special time in his life to share a week in the Alaskan wilderness with dear old dad. I can only hope that in the years to come, his memories of our trip to Olga Creek will be as treasured to him as they will always be to me. We left Seattle on a Sunday afternoon, taking an Alaska Airlines flight to Anchorage. We spent the evening in Anchorage, and caught an early Monday morning flight to Kodiak. From there, we were treated to a spectacular flight to the lodge chartered Andrews Airways (907-487-2566) floatplane. After loading our gear into a beautiful DeHavilland Beaver, pilot Ken Alligood took off on a course through Kodiak Island’s many mountain passes and inlets. The scenery is nothing short of spectacular all along the Island. Every mountain seems to be covered with mossy green vegetation that looks like it was spray-painted on. Most of the island is part of the Kodiak National Wildlife Refuge so once you get away from the town of Kodiak, you quickly find yourself in a vast and beautiful wilderness. About an hour into our flight, Ken pointed below and we saw what would become our home for the next week, Olga Creek Lodge. He flew past the end of the bay, swung around 180 degrees while dropping the nose and eased her down to water level. In an instant, the floats expertly became one with the bay and we idled up to the beach where we were met by Wade, his wife Sherry, their son George and daughter Amanda. Their other son Dustin was working another job, but he too helps at the lodge throughout the summer. Four happy fishermen were waiting to load their gear for the ride back to Kodiak, and the smiles on their faces told me all I needed to know. Of course a brief conversation was in order to confirm my suspicions. They all said we would have a great time and that there were plenty of coho to keep us busy for the week. Little did we know just how many! To my surprise we were the only guests for the week, so we were able to enjoy the full attention of our hosts. We quickly got a tour of the place and stored our gear in cabin bedrooms. Sherry insisted we sit down for lunch so we enjoyed the first of what turned out to be a great many wonderful meals. With full bellies, we were anxious to see what the place had to offer as far as the fishing. Using a large chart on the wall, Wade showed us the places in Olga Bay that we would utilize throughout the week. There was Olga Creek right next to the lodge. Then there was Akalura Lagoon, Dog Salmon Flats, and lastly Horse Marine Lagoon. Wade has a couple different skiffs at his disposal depending on need. The farthest run is to Horse Marine Lagoon, which is about 45 minutes up the bay from his camp. Dog Salmon Flats is about a 35 minute run and Akalura is about a 20 minute run if the bay is calm. Wade decided on Akalura for our first afternoon foray. We quickly slipped on our waders, grabbed our rods and jumped in the boat for the run to Akalura. As we approached, old cannery buildings on the site were impossible to miss. Many of the old buildings have fallen or been torn down, but a few yet remain as a testament to the history of the area. The cannery was in operation from the late 1880’s until 1933. I also learned that the cannery at Akalura was the home and base of operations for world-renowned Kodiak brown bear hunting guides Bill Pinnell and Morris Talifson for nearly forty years! Sherry knew both men and has some fascinating books and an old video at the lodge about those two legendary figures. They have both passed on, but their impact on Olga Bay history is well worth the effort to spend a little time investigating! Wade pulled the skiff up on the beach, as it was low tide. Curiously, the tidal variation in Olga Bay is only about 4 feet due to a major narrows between the open sea and the head of the bay. There is not enough time for the water in the bay to drain out through the narrows before the incoming tidecharges back. With hopes of catching a few coho, we climbed out of the boat and followed Wade and George up over a small embankment where the lagoon presented itself with the sight of splashing and finning throughout its reaches. Aside from all the fish I saw I was not sure at first what to think of the place, as it is very unique in its geography. Akalura Lake sits about a mile NW of the bay. A small stream drains the lake and runs into the head of the lagoon. The lagoon sits right off the bay, is less than a football field in size and no more than three or four feet at its deepest. It empties through a shallow narrow channel directly into Olga Bay. This channel is about 20’ wide and maybe 30 yards long, that’s it. You can easily see the wakes of fish as they arrive from the bay into the lagoon, and they do so all throughout the day. Low tide, high tide, it makes no difference. We spread out and began spraying casts to all areas of the lagoon. In short order we were all into bright coho. Given the fact that these fish are so fresh out of saltwater and run anywhere from 10 to 20 lbs., any thought of quickly bringing them to hand is soon abandoned. They run and jump all over the lagoon with no desire to be landed whatsoever. We got there at mid-day with the sun blazing and still managed to hook a great number of coho before the bite somewhat subsided and we cruised back to the lodge. It still being our first day we were all sorts of fired up to keep wetting a line so, after a scrumptious meal we walked up to the lagoon on Olga Creek to try our luck there. The creek empties into the bay just yards from the lodge. About 100 yards from the mouth is an Alaska Dept. of Fish and Game weir, and the lagoon starts about another 200 yards above that. Most but not all of the salmon streams on Kodiak Island have weirs on them throughout the summer that are manned 24-7 by A.D.F.G. employees to count fish. Living in cabins near the weirs, several times a day the A.D.F.G. employees go out on the weirs, pull the gate, and count each and every fish that passes through. Reds (sockeye), pinks, coho, all get counted by hand and the daily numbers can be astonishing. One of the highlights of each morning and evening is to listen in as each station broadcasts the daily fish count to A.D.F.G. managers. Ironically, the place we found the best overall fishing had the lowest daily counts of coho. The reason was that the weir there was above the lagoon. Coho entering from the bay would stack in the lagoon forever before heading upstream through the weir toward the lake. When we arrived at Olga Creek Lagoon we could see staggering numbers of coho finning the waters in front of us but to no avail. The fish were just not interested in any of our offerings. We tried everything from flies, to spoons and spinners but the fish were just off the bite. It is amazing to watch hundreds of coho turn away with total disregard and it would give lesser fishermen an ulcer trying to figure out why. I just shrugged knowing our time would come so we called it a night and headed for the quiet of our cabin where a good nights rest awaited. We awoke to fresh coffee and homemade biscuits and gravy. The bay was calm so we decided to head for Dog Salmon Creek in hopes of seeing some brown bear. Along the way we dropped Sherry off at her folks place. Sid and Darlene Omlid have been on the bay since 1964 and have quite a complex that serves as a central point among bay dwellers as the bi-weekly mail plane stops there. Most families on the bay live there seasonally and all are involved in commercial fishing. Sherry’s dad Sid is quite well known for his boat building, making skiffs of all shapes and sizes from welded aluminum. Once at Dog Salmon Creek we beached the boat and walked up the well used bear trail in hopes of seeing a few. We went well past the weir and saw lots of bear sign but no bears. Dog Salmon is where the majority of brown bear activity is on the bay. The creek was filthy with pinks and the bears had carcasses strewn about here and there. With no luck seeing bears we walked back down to the mouth to make a few casts. Before long, Wade pointed out two bears headed for the creek mouth. They stopped short when they noticed we were there. My camera was in the boat 20’ from me but I hurried as fast as I could for it. While I fumbled with my camera case one of the bears stood on its hind legs to better see us. As luck would have it, when I was finally ready to take a few photos the bears decided to run the other way. With that missed opportunity we jumped back in the boat and ran up to Horse Marine Lagoon just a couple miles further. Due to budget cuts, Horse Marine no longer has a fish weir. We ran the boat right up into the lagoon, which was very shallow and much larger than the others we had seen. It at first seemed devoid of life but as we got nearer to the actual creek we noticed a huge herd of coho finning the far shore. Fishing from the boat, we hooked a number of fish here keeping one about 18 lbs., but the weeds were frustrating. The grass growing from the lagoon bottom reaches the surface in nearly every spot so retrieving a weed free cast at Horse Marine was near impossible. On our return to pick up Sherry we noticed another bear on the beach near Dog Salmon Flats but again was denied photo proof of our encounter. We could not get close enough before it took off into the bush. With an hour to kill before dinner, we asked Wade to drop us off at Olga Creek Lagoon for a few casts to finish off the day. Good thing too, because the fish were feeling much more aggressive than the night before. In an hours time Kris Jr. and I hooked and released about a dozen nice fat coho. We felt pretty good about things as we walked the quarter-mile back to the lodge. That night after a wonderful dinner that consisted of fresh Coho salmon for the main course, Wade fired up the banya. The lodge has indoor restroom facilities, but no shower or hot running water. Instead they have a wonderful banya, which is simply a Russian style sauna/steam bath. The room is very private and consists of some finely crafted wooden benches and a hot stove with a large heated bowl of water on top. Hot rocks surround this bowl. To the side is a large bowl of cold water. Using a scoop, you simply mix a little hot water with cold to your liking in a big plastic bowl and pour it over yourself. You can lather up, rinse yourself off then sit and enjoy the warmth of the room, which can get up to 170 degrees! It is quite refreshing and you will find that after a banya session you will sleep like a slab of granite! The morning of the 28th, before heading for Akalura Lagoon we loaded up the sport fishing crab pot for a dunking. George was our guide for the day as Wade stayed back to catch up on some chores around the lodge. George cruised past Akalura about halfway to Dog Salmon Creek before setting out the pot in 300’ of water. I am used to fishing Dungeness crab at about 40’ so this was quite an eye opener. We were after Tanner (Snow) crab, but were warned there was a lot of King crab around which could not be kept. After dropping the crab pot it was off to Akalura. The tide was high so George just ran the boat right up the chute and into the lagoon where we immediately hit the beach and began tossing our lures. We had great luck with Vibrax spinners in sizes 3 to 5, but overall the best lure going was the Flash-Glo spinner. The fishing was fast and furious for about three hours as Kris Jr. and I kept George busy with the pliers. At one corner of the lagoon Dolly Varden trout stack really heavy. While Jr. and I worked over the coho, George snuck down to do a little dry-fly fishing and was having a field day. I grabbed my 3- weight St. Croix from the boat and tied on a good-sized elk hair caddis, quickly scurrying to get to that part of the lagoon myself. Almost every cast brought a quick rise from a Dolly, and we hooked and released a good bunch of them. Before long, Kris Jr. was at my side checking things out. He had never fly-fished before so I gave him a few pointers then watched as he had a field day himself. I left him there with George while I walked back to fight some more coho. I decided to try tossing a U-20 flatfish, a lure we do well with here at home and it brought the expected vicious strikes. The weather was gorgeous and we had pretty well ruined ourselves on the coho and Dolly fishing so we decided to head for the lodge and call it a day. I was happy to enjoy another of Sherry and Amanda’s fine meals and relax at the ranch. No day-end fishing was called for on this fine evening, so instead I fixed myself a cocktail and sat on the porch with a fine cigar watching the most amazing sunset one might imagine. Sometime during the night the weather turned for the worse and the wind and rain came from seemingly out of nowhere. This kind of got me jazzed because I knew that there was a good chance the fish in the lagoon at Olga Creek would be turned on by the foul weather! After a hearty breakfast Kris Jr. and I buttoned up our rain jackets and headed for the lagoon. Upon our arrival, we found the usually calm lagoon was being stirred about by the wind and rain. With high hopes we made our first casts. In seconds we were into our first of many double- headers. In about three hours, I think we hooked around 40 mint bright coho, keeping a number of big males for the cooler. The daily limit on Kodiak is 5 salmon per person/per day, but we were selective. We decided one full box of fish to take home would be plenty. Things finally started to slow a bit, but my kid continued to put on a clinic with a streak of six fish in a row. He kept telling me school was in session and to pay close attention! Mercifully George showed up telling us lunch was ready. The soup and sandwiches Sherry had on the table was the perfect antidote to the wet rainy morning. As things sometimes go, after lunch those hundreds of coho that attacked our every cast in the morning gave us the complete thumb in the afternoon. We gave it hell but to no avail. The weather had calmed a bit and the bite was just off. It’s hard to imagine, but just because there are tons of fish does not mean they will strike. It comes and goes but one this is for sure, pray that the bearings in your reel are up to the task when it comes on! The morning of Aug. 30th, we headed directly for Akalura Lagoon. With the storm the previous day, we figured the lagoon would be loaded with fresh coho and we were absolutely right. On this day, we enjoyed without a doubt the best coho fishing I have ever experienced! I have been blessed with some fabulous fishing over the years, but in all honesty I have never seen coho fishing so fast and furious in my entire life. It was just total mayhem! My son forgot to inform me that the leader on my 3-weight fly rod had been broken off a couple days earlier and was now. So upon our arrival I took a minute to repair it so it would be ready when needed in case those Dollies started rising. In the few minutes it took me to do so, Kris Jr. landed four coho! Seeing all those silvers finning in the lagoon is just a rush and something you have to see to believe. Soon enough I was ripping lips as well, and poor George was working overtime with those pliers! Imagine fighting a fresh 17 lb. coho minutes from saltwater. It takes you six to eight minutes to bring it to shore and that’s using 15 lb. test line. Once free of the fish you take a deep breath, make another cast, and firmly set the hook into another, and another, and another. This went on for six solid hours until telling Wade we could take no more and begged for mercy! My son coined the term “Bent Rod Productions” to describe the free-for-all! 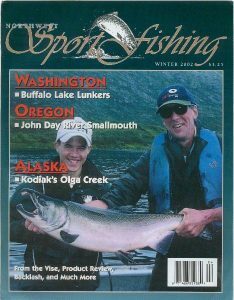 All told, we hooked somewhere between 75 or 80 coho salmon in Akalura Lagoon that day give or take a few. Try doing that at home! We still had our crab pot to pull, so we jumped back in the skiff for the run up the bay to where we had dropped it two days before. Wade has a winch on board for just such a task but it takes awhile to pull 360’ of line and a large crab pot. Once onboard we found it to contain only two Tanner crabs, but my lord was it full of King crab! It is illegal to take King crab from Olga Bay, so we took a few photos and sent 15 or 20 of them back to the safety of the bay. Those things are huge and Wade said each one was worth about $200.00 on the fresh market. We went to fish Olga Creek Lagoon the next morning as a strong NW wind made it tough to travel on the bay. The kid and I hooked about 15 coho before we both realized it hurt too much to fish. Believe me, our arms, our finger and wrists were damaged goods from all the abuse the coho had laid on us the three days prior. We retreated to the sanctuary of the lodge where we both took in some needed sofa time and got a chance to read up on the local history of the bay and the island. Olga Creek Lodge has been in business since 1999 and grew out of the love for the area that both Wade and Sherry share. Sherry moved to Kodiak with her folks in 1963 and grew up on Olga Bay, spending virtually all of her summers there since her folks purchased their Olga Bay property in 1964. Her family has long been involved in the commercial fishing industry. Wade grew up in Seattle’s Queen Ann district, but moved to Alaska the day after he graduated from High School in 1975. He supported himself by working in the commercial fishing industry for salmon, halibut, and crab. When he’s not commercial fishing in early summer or catering to sport fishermen in early fall, he’s running the watering hole he owns in Kodiak. Olga Creek Lodge is a small family-run venture that caters best to groups of two to six people. It is ideally suited for families interested in spending some quality time in the wild Alaskan wilderness. This is not your typical corporate lodge. In fact it is the antithesis of that. When you stay with Wade and Sherry Ball for a week, you become part of their family. Everyone joins in at the dinner table and Sherry, with the help of her daughter Amanda, is a fabulous cook. If you go hungry at her table, it’s nobody’s fault but your own! The season at Olga Creek runs primarily from around the first of August until the end of September. The coho fishing all around OlgaBay is simply phenomenal. While you can catch them using fly gear, these fish are far more aggressive toward spoons and/or spinners. More so in fact than any I have ever encountered. The shear numbers of fish is extraordinary! To give you an idea, the A.D.F.G. counted 1600 coho through the Olga Creek weir in just the last three days we were there! All those fish stack in a lagoon less than the size of a football field and offer some of the finest sport fishing imaginable! I said it at the beginning of this article and I’m going to say it again. This has to be the best-kept secret in Alaska. Rates at OlgaCreek are very reasonable when compared to other Alaskan lodges and the opportunities are endless. Fishing, beachcombing, bear viewing or simply relaxing with a good book or a wonderful view of Olga Bay and Kodiak Island’s rich and rugged mountains. Wade is working on some hunting opportunities as well for the near future. There are lots of deer and ptarmigan around for hunters to enjoy. While not actually a hunting guide, Wade does have a transporters license so he can ferry you around to the good hunting spots. There is precious little private property to be had in Olga Bay. Most all of it is either part of the Kodiak National Wildlife Refuge, or is owned by the local native corporation. This means that few (if any) other fishing lodges will be popping up in the area, and Olga Creek Lodge will enjoy the benefits of this rich environment for years to come. Our last morning there while waiting on our plane, I stood at the mouth of Olga Creek and watched an endless train of reds and silvers pushing their way into the tiny creek. All too soon, Fred Ball of Andrews Airways was landing the next party on the shores of the bay and we were saying our goodbyes. As Fred pointed out all kinds of cool things during our awesome flight back to Kodiak, I could not help but think what a wonderful experience my son and I had just shared. Always keep in mind when traveling to remote places in Alaska that weather is an all-important factor in getting you to and from your destination so be flexible with your schedule. We had a little of everything during our stay. It was quite nice most of the time, but we had fog, wind, and a little rain mixed as well. Typical Alaska weather for that time of year so pack your gear accordingly. Plan to bring your own fishing equipment along with you as well. We used steelhead type spinning rods with 15 lb. test line and I would suggest nothing less. Flash-Glo and Vibrax spinners in various sizes and colors worked exceptionally well for us, as well as some Pixie spoons. When fishing target rich environments such as this, I have a five-minute rule. If I don’t have a strike in five minutes, the lure comes off and something else goes on! For you fly-fishing enthusiasts, you’ll have to try a little of everything to find something that works. You’ll also find that a floating line works best, as the water is so shallow. It is only about three to four feet deep in most fishing spots. Your patience might be tested flinging feathers, but your persistence will be rewarded. If you’ve been contemplating a trip to the Alaskan wilderness, you simply can’t go wrong with a visit to Olga Creek Lodge. The fishing is out of this world, the accommodations are comfortable, the meals are wonderful and the hospitality is genuine. It is the perfect place for a memorable family getaway, or for fishing buddies to share some thrills and trash-talk each other into angling oblivion! You can reach Wade and Sherry by phone at (907-486-3046), or by e-mail (olgacreek@gci.net). I would strongly suggest booking your trip far in advance as the prime season is relatively short and space is limited Kris Jr. and I can’t thank Wade, Sherry, George and Amanda enough for making our visit one for the ages. We wish them all the success in the world, as no one deserves it more.